My name is Carl and I'm a basketball addict. Last year I watched every single San Antonio Spurs game - and a lot of other games too. I play basketball a few hours a week - I used to play a lot more. I go to basketball games when travelling abroad - last week I was watching a B league game in France. When not reading about data and visualisation, I'm reading about great players and teams. If that is not an addiction, I'm not sure what is! My day job splits my time between data visualisation and analytics so it is of little surprise that come the weekend, I use those skills to explore aspects of my basketball addiction. As an analyst, I am naturally curious so I want to dissect the game to improve my understanding of what is going on within the games, teams and league I spend so much time watching. Tableau allows me to do exactly that. In the space of a couple of hours I can get the data, explore it, visualise it and share what I find through my blog. For example, as October rolled around, I wanted to understand how each NBA team went about allocating their Salary Cap space. Tableau's new box and whisker capability in Desktop version 8.1 allowed me to hold all 30 teams alongside each other and compare the distribution of contracts across their players. Did the Lakers tactic of allocating the majority to Kobe work? (Hint - worst record in the western conference) Or did the Spurs balanced method lead to greater success? (best record in the NBA at the time of writing). 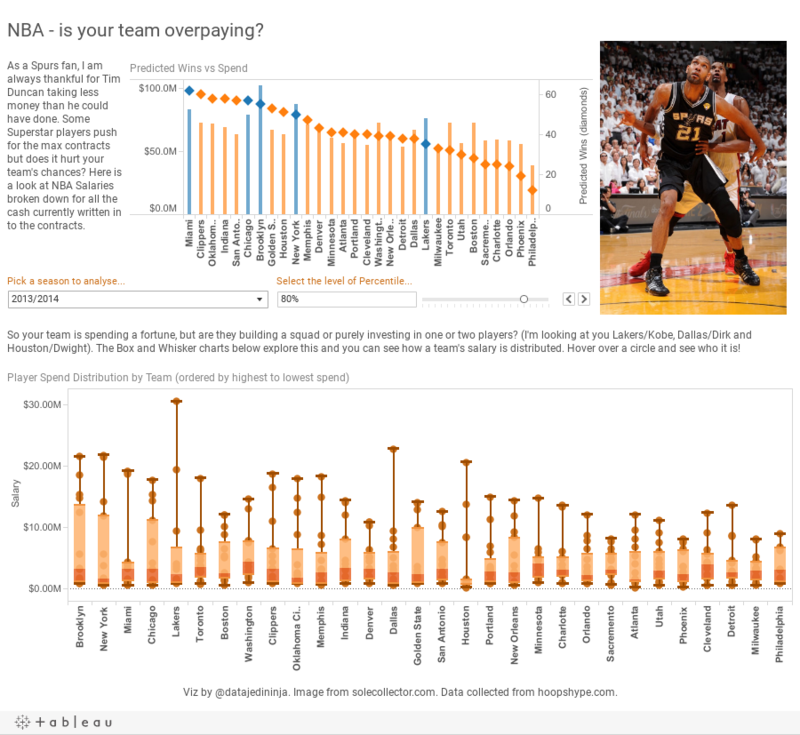 Taking data from Hoopshype.com, I was able to map spending this year to understand the different strategies in play in the space of an afternoon. But what about on court performance? Proving ideas right or wrong that I form from watching the games led me to taking data from Stats.nba.com. 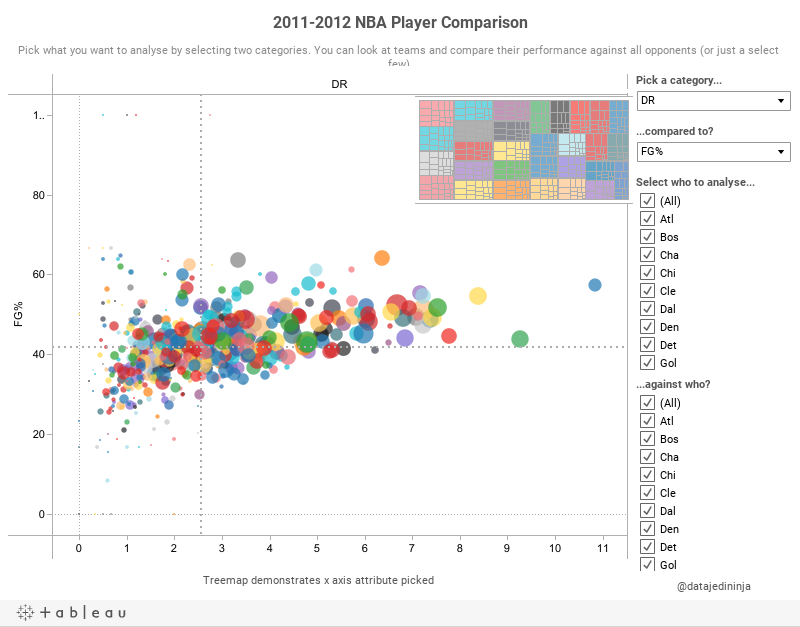 Not only have the NBA stepped up their visualisation for fans on the site but the depth of data is getting far better. I like to explore different performance measures through utilising Parameters in Tableau to quickly flick between metrics to see a visual representation. See Peter Gilks and my presentation from Tableau Customer Conference last year to learn some hints and tips as to how to do this. Basically, I'm creating self-service reporting for myself to approach at any time (again off the blog in case I don't have my laptop close by). Here's what I came up with at the launch of version 8. But where next? Well I'm looking for more advanced data sets. I want to complete more spatial analysis and link this to performance of the teams and players. SportsVu is the latest tracking technology in the NBA and I would love to get my hands on this data and see what I can do with Tableau to produce great insights that will add additional layers to my understanding of the game. You may have noticed that from the above that as Tableau releases more functionality in their ever evolving tool, I utilise it to create those additional layers all in those odd hours at weekends. So no matter your sport or hobby, there will be data available on line or collectible through personal devices that will let you see something knew and enjoy those pastimes in a whole new way. Happy vizzing everyone and good luck with the first IronViz competition!